I've added a ventral display adapter, for potential flight scenes, because attaching my standard holder arm might not work properly on this one and lead to structural failure... Also not the considerable PSR work in general, but also along the parts that are supposed to fit OOB. ...which come from an 1:100 A-10 and have a slightly bigger span, so that the exhaust gases from the fornt engines won't be ingested by the rear ones. 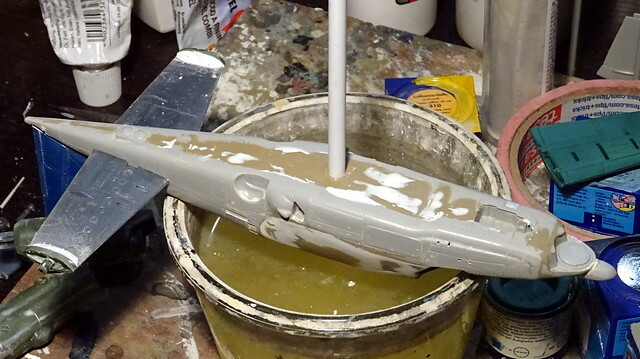 I'll also need some space for ordnance, since the large propeller discs seriously limit anything that fires forward! A true conceptual flaw. Otherwise, the thing looks just odd. All the time the thing's profile reminds me of a small Piper lightweight aircraft, and the wings of almost equal span look weird, too! Wow, that's looking great, and suitably crazy (in a good way)! For some reason I wasn't expecting the four rotor layout but it looks killer. Is it's mission similar to an attack helicopter or something different? Its just what the Marines need to keep up with the MV-22s. Yup. Countering attack/anti-tank helis and slow, low-flying aircraft like the A-10, plus CAS missiosn, with emphasis on the Western European TO. The props/rotors are smaller diameter than I expected. Progress slowed down, since I now move attention to smaller things. 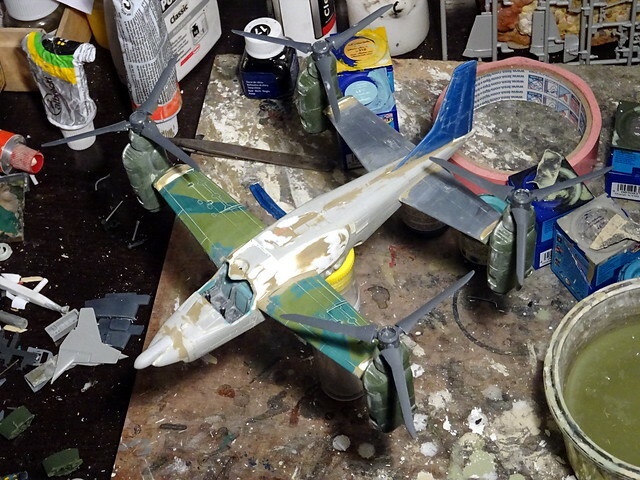 Dry-fitted the canopy, and it seems to fit well despite the fuselage mods. 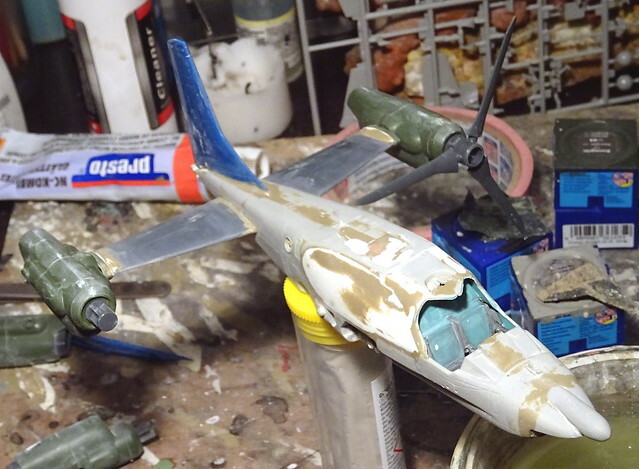 I also decided to upgrade the landing gear - instead of the OOB parts I will implant a complete arrangement from an Italeri 1:72 MiG-37, and I will add covers, too. 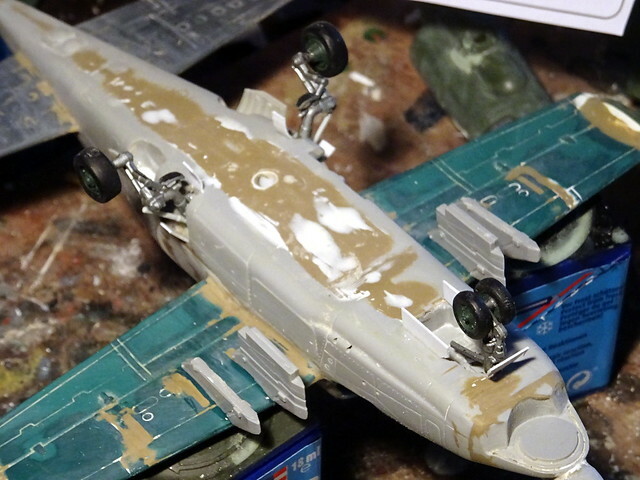 With the wings and the engine nacelles added, I found the original wheels to be a bit small - and I wanted more ground clearance, for the rotating nacelles and for potential ordnance carried ventrally. Thanks to the wider front wings I will be able to add probably two pairs of pylons under the inner wing sections, too, and I will retain the OOB 30mm gun, because it fits conceptually well. Sensors will be added under the nose and on the roof (hence the choice of the Italeri Ka-52, it actually depicts an interim layout of the helicopter, the final sensor configuration differed considerably), and the thimble radome was added because it is part of the illumination radar for 9M120 Ataka anti-tank missiles (or as a potential search radar), as seen on the Mi-28. More slow progress (pics to follow): the aircraft/thing stands on its own three new legs, and it's looking good - even though the rotating nacelles come VERY close to the ground. Now I know why the V-22 has shoulder-mounted wings... Not certain if I take further action, e .g. shortening the nacelles? I also added the first weapon stations under the front wings and selected ordnance, but there's still a lot of small stuff to do. 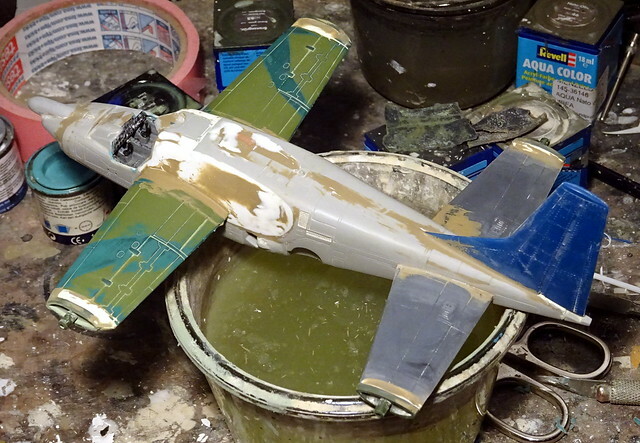 I also settled upon a livery: this one will receive a rather "normal" Soviet four-tone tactical camouflage scheme with light blue undersides. It's intended to become a prototype aircraft, but for state acceptance trials a "realistic" scheme won't hurt. (Far from finished but) good! She really doesn't look like a helicopter anymore! Yes, the Ka-52 has serious whiffing potential. I actually came to it as a donor fuselage because I contemplated building a "real" aircraft from it, a kind of Su-25 with a side-by-side cockpit and a radar nose. Besides, I spent the last two days with eliminating my own conceptual flaws, caused by the low-set wings. I shortened the nacelles (trimming away the exhaust cover) and bent the MiG-37 main landing gear so far that the tail came higher on the gorund, so far that the nacelles do not touch the ground anymore when in vertical position. Still looks goofy, but better than before. 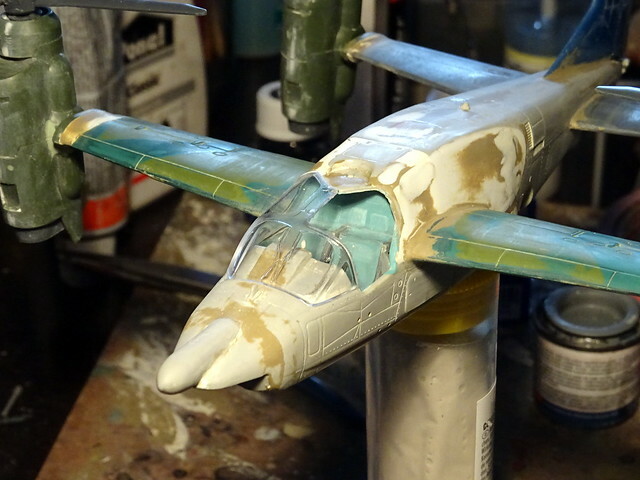 Today I also glued the windscreen in place, and did some cosmetic work like filling the many holes under the cockpit for the original fixed steps, which do not make sense anymore on an aircraft that flies probably twice as fast as a conventional helicopter. I also did further work on the ordnance - this one will probably only carry guided missiles under the wings and the fuselage.